For a family treat over the Easter holiday, choose a lean piece of gammon. Any leftover gammon can be used in sandwiches and salads. Place the gammon joint in a large pan. Just cover with cold water then bring to the boil slowly. Reduce the heat, cover and simmer gently for 65-70 minutes. Meanwhile, strip the rosemary leaves from their stalks and chop finely. Mix the rosemary leaves with the sugar, mustard and lemon zest. Cook the potatoes in boiling water for 5 minutes, then drain. Preheat the oven to 180°C, gas mark 4. Drain the gammon, reserving 500ml of the cooking liquid. Remove the string and cut away the skin to leave a thin layer of fat. Place the gammon in a large roasting tin, skinned side up, and spread with the mustard mixture. Pour the reserved liquid around the meat. Add the potatoes to the roasting tin with the bay leaves and shallots. Place in the oven to bake. After 30 minutes cooking time, stir the baby leeks and broad beans into the potatoes and shallots. Bake for a further 40-45 minutes until the vegetables are tender. Transfer the gammon and vegetables onto a serving platter. Remove and discard the bay leaves, reserving the liquid in the tin. Place the roasting tin on the hob and stir in the crème fraîche and some black pepper. Let it bubble for 2-3 minutes, until slightly thickened. 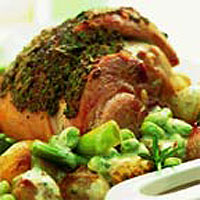 Serve with the gammon and spring vegetables. If baby leeks are not available, use full size leeks cut into thirds, lengthways.